The Town of Innisfil's Grant Cowan (centre) and Matthew Quigley (right) accept the MISA Ontario 2018 People's Choice Award from past president Christine Swenor (left). HAMILTON, ONT. 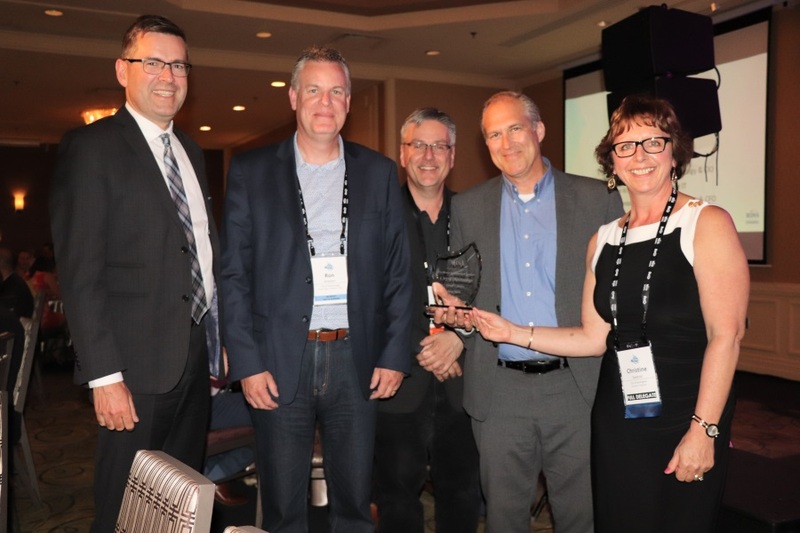 – The Cities of Toronto, Mississauga, and Cambridge, along with the Town of Innisfil, were among the big winners at the Municipal Information Systems Association (MISA) Ontario chapter’s annual conference Monday night. 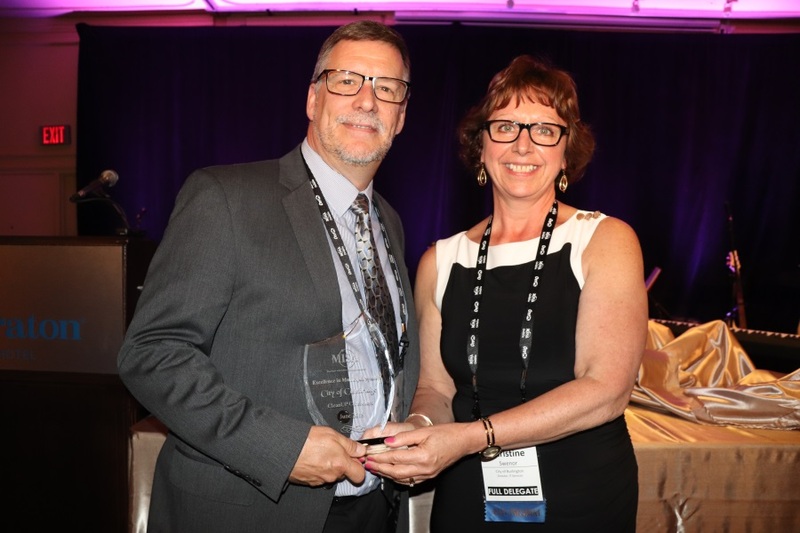 Two of the chapter’s Excellence in Municipal Systems awards, honouring the province’s top smart cities projects, were presented to the City of Toronto for two separate initiatives, while the other winners received one award each. Other winners included City of Windsor CIO Harry Turnbull, who received a Lifetime Membership Award, and the Town of Innisfil, which received the conference’s coveted People’s Choice Award in addition to its Excellence in Municipal Systems award. 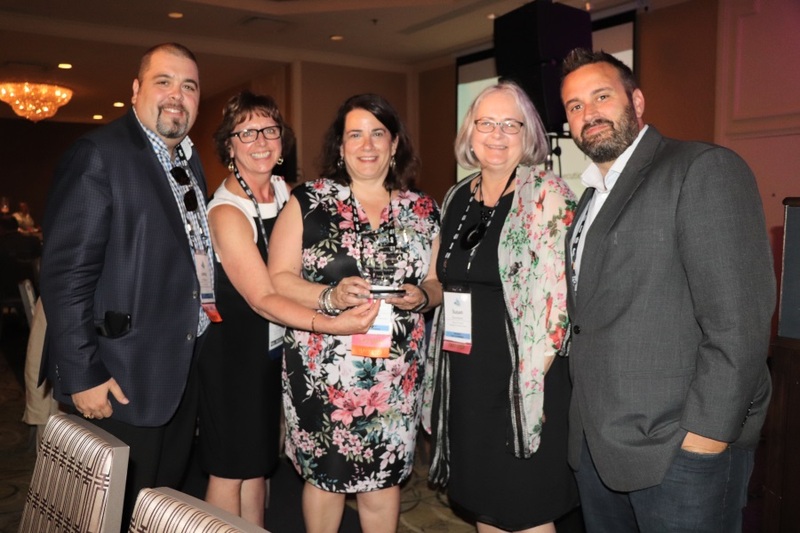 The Excellence in Municipal Systems award winners were judged by a panel made up of representatives from various municipalities, who were forced to choose between what MISA Ontario staff called “a record number” of digital transformation initiatives. As MISA Ontario past president Christine Swenor put it when introducing the Excellence in Municipal Systems award winners, participants were judged based on how well their initiatives supported their city’s strategic objectives; the degree to which they demonstrated an improvement in service delivery to clients, citizens, or businesses; and their level of collaboration between IT and other city departments. “It was a tough decision… because they’re all so high calibre, and what’s great is that we can learn from all of them,” Swenor said. The City of Cambridge, represented here by IT manager Robert Delorme, for developing CleanUP Cambridge, a digital platform aimed at helping the city clean up drug waste. The Town of Innisfil, represented here by IT manager Grant Cowan (centre) and GIS analyst Matthew Quigley (right), for developing custom GIS applications, a digital municipal work order solution. The project also earned the duo MISA Ontario’s 2018 People’s Choice Award. The City of Mississauga, represented here by CIO and IT director Shawn Slack (second from right) and IoT project manager Ron Kremer (second from left), for its Virtual Campus. 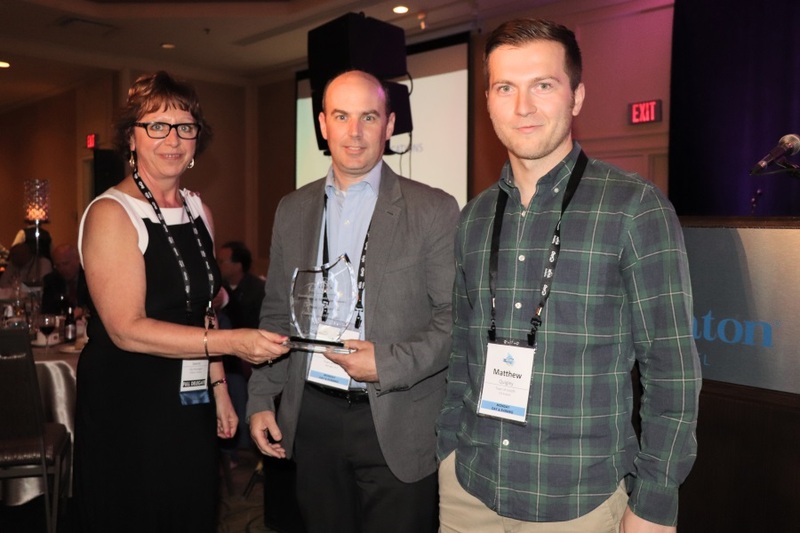 The City of Toronto’s first award, which Abere Channie (right) and Richard Ng (second from left) accepted on behalf of CIO Rob Meikle, was for its Project Tracking Portal, which the city uses to digitally coordinate road work. The city’s second award, represented here by legal services director Kalli Chapman (centre) and senior systems integrator Lenny Di Marco (left), was for its Parking Tags Administrative Penalty System, a parking solution that allows residents to pay for parking tickets online. The evening’s other big winner was City of Windsor CIO Harry Turnbull, recipient of the 2018 MISA Ontario Lifetime Membership Award. 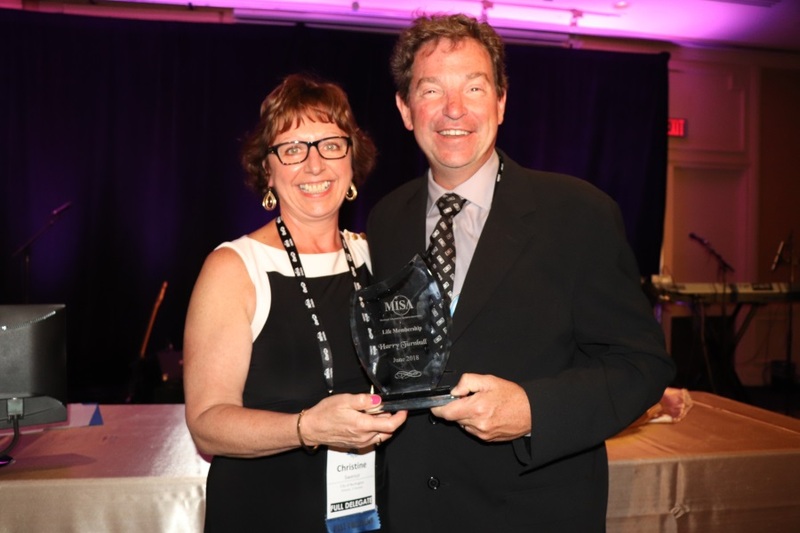 According to past president Swenor, Turnbull (above) won the award not only for supporting MISA Ontario for the past 26 years (18 of them as Windsor’s CIO), but for serving on the organization’s board of directors; for spending various years as vice president, president, and past president; for hosting the organization’s annual conference twice; and for proving instrumental in the creation of MISA Canada’s online InfoBase service and the organization’s international counterpart, the Linked Organization of Local Authority ICT Societies (LOLA). Asked to share his own reaction, Turnbull called the award “fantastic” and emphasized that working in municipal government and collaborating with MISA was “a passion of mine”. Other award recipients included SHI Canada, which received the organization’s Partner of the Year Award for its ongoing support of MISA Ontario; Town of Whitby technology and information services manager Daniel Munns, who received the John Cushing Award of Merit; and former City of Waterloo IT director Garry Bezruki, who also received a Lifetime Membership Award. Stay tuned to ITBusiness.ca for a more detailed breakdown of the five smart city projects that were declared Ontario’s best, to be published in time for the September 2018 issue of MISA’s official magazine, Municipal Interface.